Deter dogs from using your lawn to eliminate with this Esschert Design White Cast Iron "NO!" Peeing Yard Sign. The immediately recognizable shape of this sign makes its meaning clear at once. A cast iron figure of a dog with a raised leg forms the top of this adornment, and the raised word "NO!" rests on the dogs body. The aged white color of the dog and stake contrasts your grass, and the slightly distressed finish on the edges add dimension. The 5.5" long stake inserts into soil for a quick display, and the cast iron construction ensures strength and durability. The word on the figure will remain clear and visible to any passing dog owners thanks to its black color. 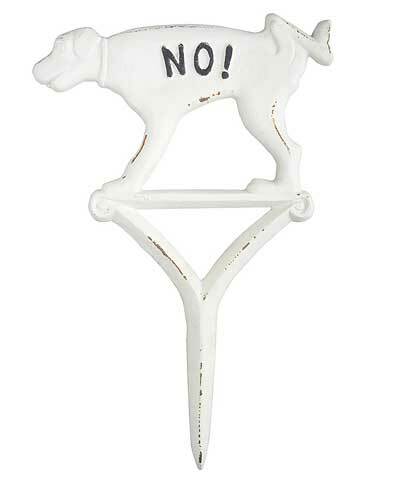 Keep your lawn free of dog elimination by placing this White Cast Iron "NO!" Peeing Yard Sign in it.